History: This temple is 1000 to 2000 years old. one of the 42nd Shiva temple on the northern bank of Cauvery praised in scriptures.This temple is nowadays known as Nandaangkovil.The original name Thiru Nandu (meaning crab) Devan Kudi.The hole through which the Cancer (Nandu in Tamil) entered the body the Lord and scar caused by Indira are visible on the body of the Linga. The image of a golden crab as well as the hole created by it can be seen on the Shivalingam during the ablution rituals (abhishegam). It is believed that this Crab was a Yaksha who taunted Sage Dhurvasa. He imitate the walk of the Sage like the crawl of a crab and made fun of him. The Sage who was well known for his short temper, cursed the Yaksha to turn into a crab. Quickly realising his folly, the Yaksha apologised to the Sage and sought a remedy. The Sage advised him to worship Lord Shiva at this temple for absolution of his sin. A chola king who was ruling in this place had an attack of paralysis and no doctor was able to cure him. He fell at the feet of Lord Shiva finally. Lord in the form of an aged couple came to his court, gave him the water dissolved with sacred ashes. The king got up completely cured and requested them to stay in the place as royal doctors which they declined. He offered them gifts of gold which too they denied to accept. When the king asked them what exactly they wished, brought him to this place and asked him to build a temple where the Shivalinga was then and simply disappeared then. The king understood that the visitors were but Lord Shiva and Mother Parvathi and built the temple. People pray to Lord here for relief from disease-Pini in Tamil.Saint Gnanasambandar has mentioned Lord in his hymn as Pini Neekkum Shiva. There are two Ambica shrines side by side. During the construction of the temple, Ambica in the place was lost. Hence, a new Ambica idol was made and installed and named Arumarundhu Nayaki meaning that She came as a medico. Within a few days, the original Ambica idol also was found and installed with the name Apoorva Nayaki. She is the main Ambica of the temple. This is the temple to seek relief from the Karkadaka-Cancer in English and Nandu in Tamil-zodiac sign comprising of three stars-Punarvasu, Poosa and Ayilya.People born under this Nakshatram/ Rasi are advised to light Nallennai vilakku (Sesame or Gingely Oil lamp) and worship Lord Shiva on ashtami (eighth day from New Moon or Full Moon), New Moon days, Tuesdays and Saturdays apart from Ahilya Nakshatram thithis. Chandra in this place is in yoga posture and this is a Chandra dosha nivarana sthalam. The Shivalingam has the mark of a cut on its face. Travel Information: Thiruvisayanallur is a village near the town Kumbakonam. 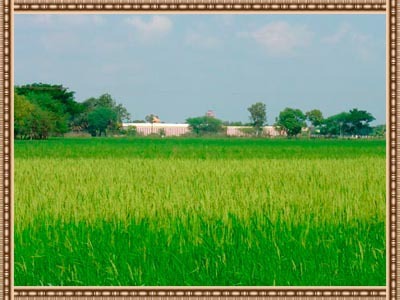 The temple is situated surrounded by paddy fields and is located 2 Kms from another Paadal Petra Sthalam Tiruviyalur (Tiruvisainallur).The Nearby temples are Sivayoginathar Temple and Sundareshwarar swamy temple (Petti kali Amman) Karuppoor. Contact:20/27, South Street, Veppathur Post – 612 105, Tiruvidaimaruthur Taluk, Tanjore dist.